Ever have a food that simply satisfies your soul? That’s kind of what soup does for me in general, but this soup in particular… man does it hit the spot. Especially on cold winter nights, like this week when we were snowed in. 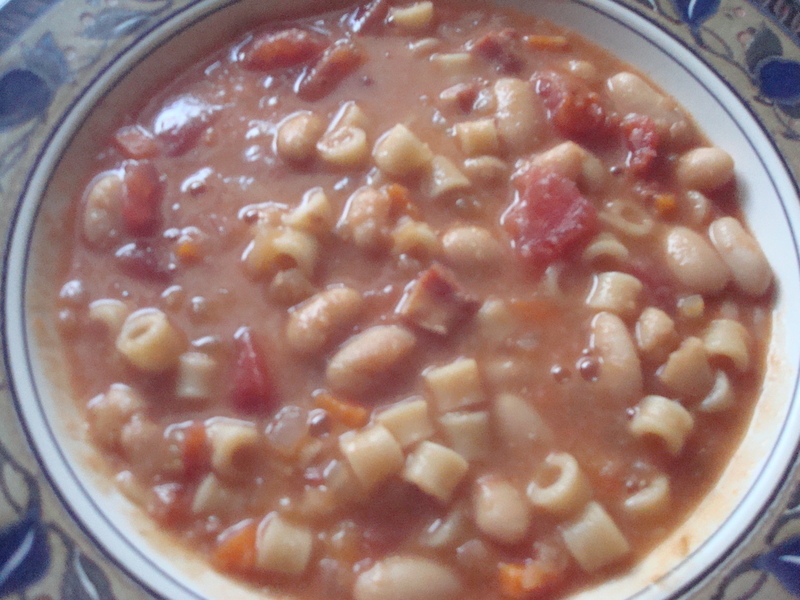 On nights like that I like to serve up a bowl of a hearty, tasty, satisfying soup and pasta fagioli fits the bill perfectly. 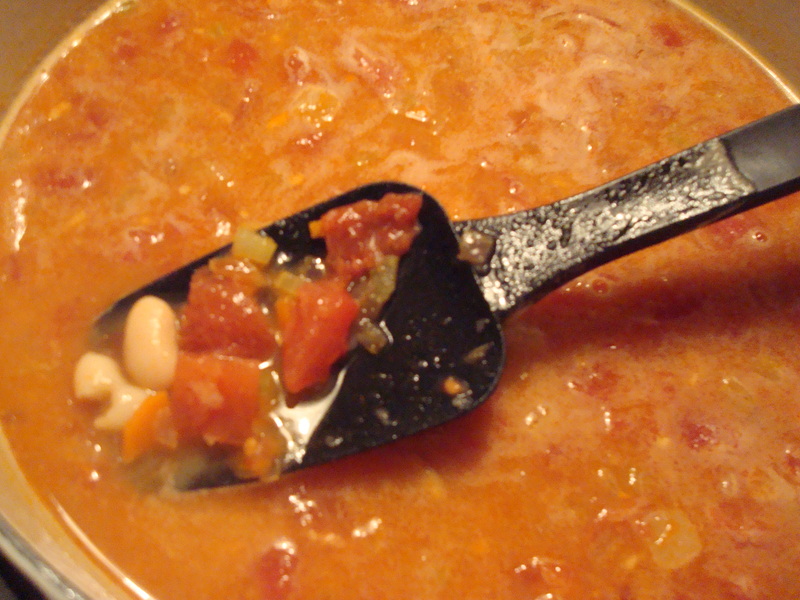 This soup, like most I make, can be made as is or converted to vegetarian very simply. Just omit the pancetta and use vegetable broth. Boom, done. Hearty, tasty, satisfying vegetarian soup. In a 5 1/2 quart heavy bottomed soup pot heat the oil over medium heat. 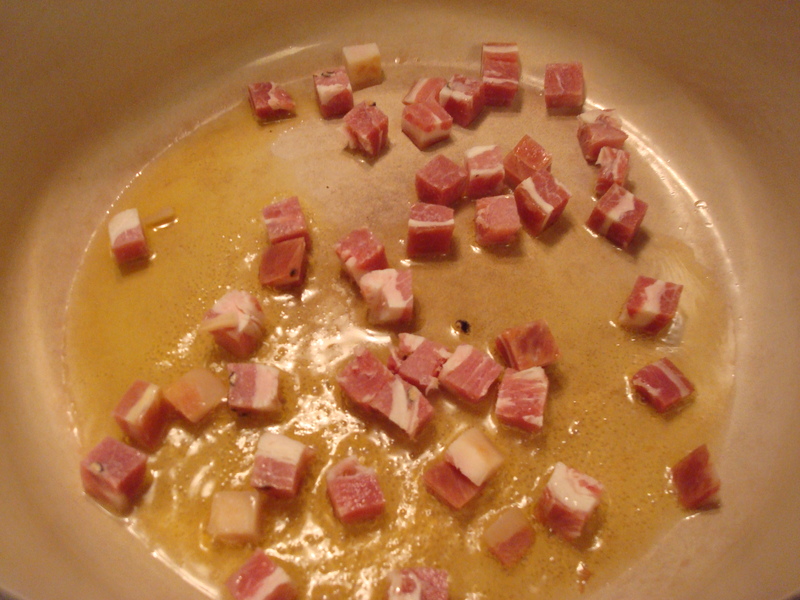 When heated add the diced pancetta and cook for 2-3 minutes. Then add the onion and stir to combine. Cook over medium heat for approximately 10 minutes, or until the onion has softened and it’s color faded a shade or two. 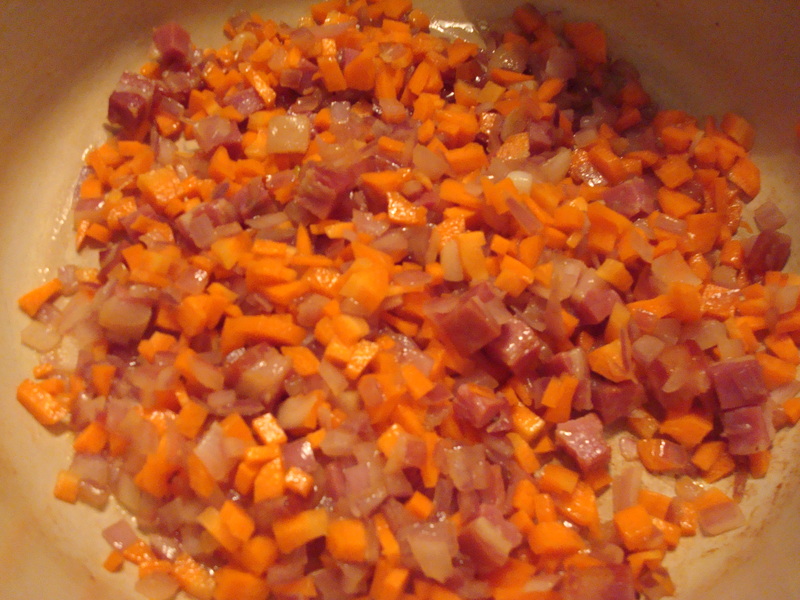 Add the carrot, cook for 2-3 minutes. Then add the celery and cook for 2-3 minutes. 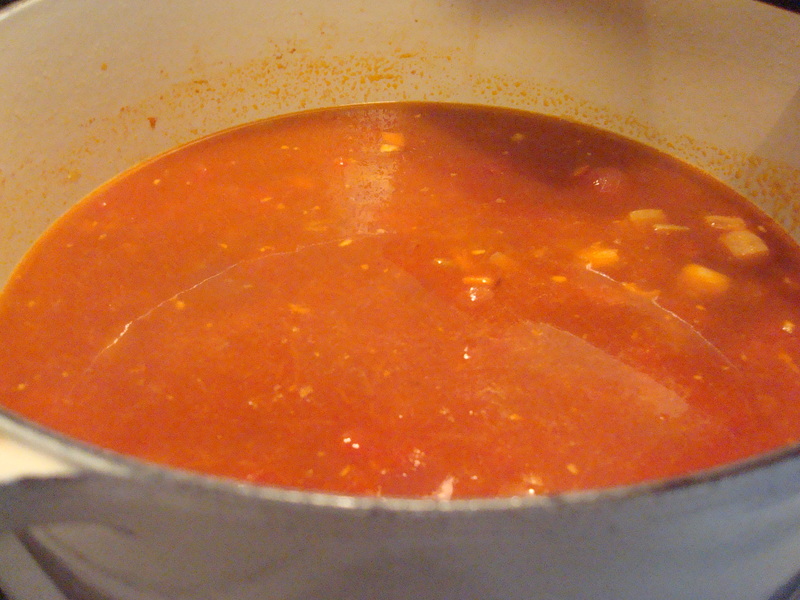 Then add tomato paste and cook for 2-3 minutes. Then add the garlic and cook for no more than 1 minute, stirring continuously, and then quickly add in the stock making sure to scrape up all the browned bits on the bottom of the pan. (At this point your kitchen should be so deliciously fragrant you’ll want to eat the air.) Add the tomatoes with their juice and stir to combine. Remove two ladle-fulls of broth from the pot and put them into a 4 cup measuring cup. Add to the measuring cup one and a half cans of cannellini beans, drained and rinsed and puree with an immersion blender until smooth. Then add this mixture back to the soup pot. Add the rest of the beans, drained and rinsed. Salt and pepper to taste. At this point the soup needs to simmer, gently, for about 20 minutes before being finished. However, you can also leave it there over the lowest heat setting for six hours and it will only get better with time (you will have to stir it occasionally). 10 minutes before serving, bring the pot up to a boil and add in the pasta. Once the pasta is cooked through the soup is ready to serve. UPDATE 9/12/11: I’ve been experimenting with reducing the amount of fat in some of my recipes. The recipe as I originally posted it called for 2 tbsp of olive oil. I’ve recently realized that a little goes a long way when sauteing onions. I’m now reducing the olive oil to 2 tbp and it makes no noticeable change in the flavor of the finished soup. However, it does reduce the calories per serving from 318 to 285 and reduces the fat grams per serving from 10.9 to 7.1. It may not seem like much, but over the course of a day, this can add up. It also keeps the fat at lower than 30% of the total calorie intake for the item, which is a better ratio for weight loss or weight maintenance.